This is the best photo ever featured on this blog. The 1,575th best result all-time in women’s 3,000m steeplechase belongs to Delilah DiCrescenzo from USA. 9:40.63 minutes, that’s her PB. Delilah’s time is not an amazing result for the international level. 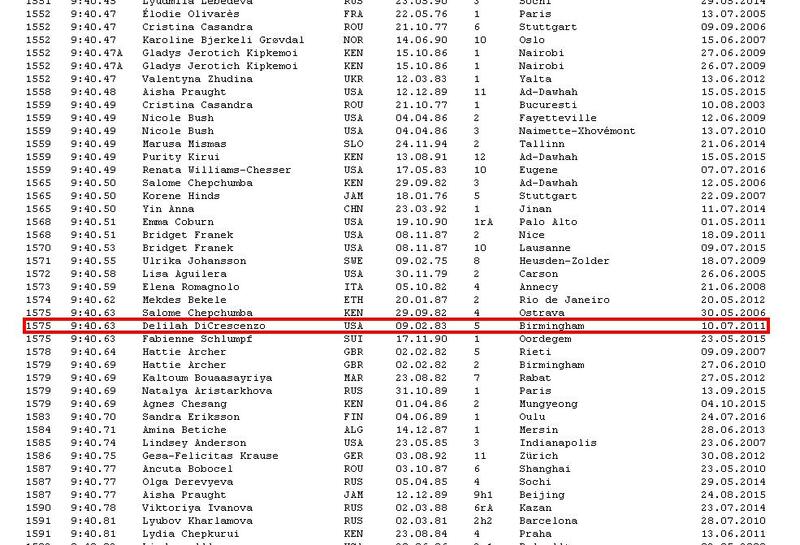 It is a good time, which is not far off a time needed to win a medal at the European Championships, but it’s about 48 seconds off Ruth Jebet’s WR. She never participated in the Olympic Games or in the World Championships. So what’s so special about Delilah DiCrescenzo? Well, she is THE Delilah, the subject of “Hey There Delilah”, that wonderful song by Plain White T’s. I think this is one of my favorite music trivia pieces evar. This entry was posted in Music and tagged 3000m Steeplechase, Athletics, Delilah DiCrescenzo, Plain White T's, Track & Field on September 13, 2016 by michaelbrus25.